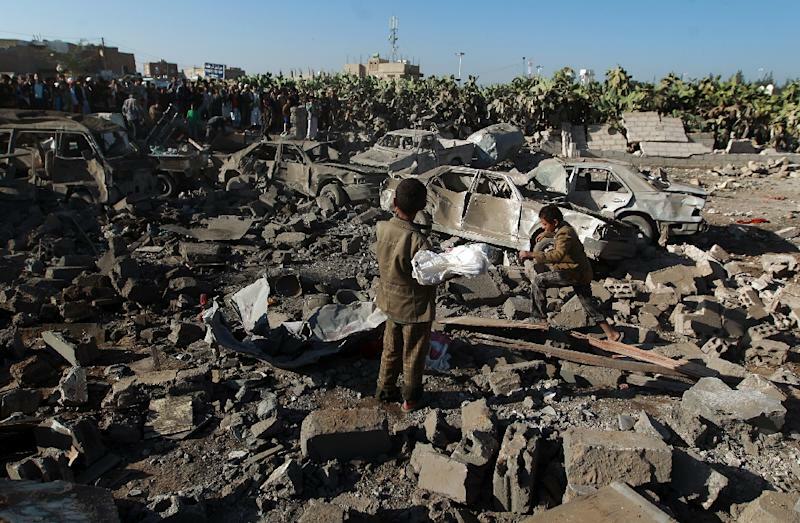 Sanaa (AFP) - Warplanes from a Saudi-led Arab coalition bombed Huthi Shiite rebels on Thursday in support of Yemen's embattled president, as regional rival Iran warned the intervention was a "dangerous" move. Arab League chief Nabil al-Arabi, on the eve of a regional summit in Egypt, declared his full support for the strikes against the Huthis who he said had carried out a "coup" in Yemen. Their advance raised Saudi fears that the Shiite minority rebels would seize control of the whole of its Sunni-majority neighbour and take it into the orbit of Shiite Iran. Tehran condemned the Saudi-led intervention as "a dangerous step" that violated "international responsibilities and national sovereignty". Huge explosions were heard in Sanaa as warplanes pounded an air base adjacent to the international airport and other locations, an AFP correspondent reported. At least 14 civilians were killed when seven homes near the air base were reduced to rubble, a civil defence source said. The International Committee of the Red Cross warned that "ordinary Yemenis -– already hit hard by years of conflict -– are now enduring the effects of this escalation". At daybreak hundreds of Sanaa families streamed out of the capital seeking the relative safety of the provinces. 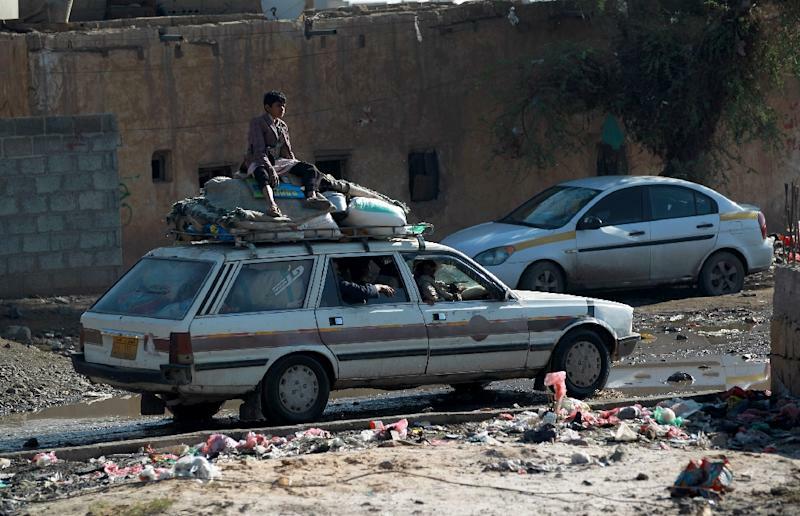 "I am leaving with my family -- Sanaa is no longer safe," said one resident, who gave his name only as Mohammed, as he piled his belongings into a minibus in the Bani Huwat neighbourhood. In the south, residents reported hearing explosions at the huge Al-Anad air base, north of Aden, which was seized by anti-government forces on Wednesday. The Saudi ambassador to the United States said the operation had begun with air strikes but that the kingdom and its allies stood ready to do "whatever it takes" to protect Hadi's government. Ambassador Adel al-Jubeir said the kingdom had assembled a coalition of more than 10 countries, including five Gulf monarchies. Washington said President Barack Obama had authorised the "provision of logistical and intelligence support" for the campaign. "The Royal Saudi Air Force has taken out the Huthi air defences and destroyed numerous Huthi fighter planes," a Saudi adviser said, adding that air force "has pretty much secured most of the Yemeni air space". Saudi-owned Al-Arabiya television said the kingdom had deployed 100 fighter jets to the operation, while the United Arab Emirates had committed 30, Bahrain and Kuwait 15 each and Qatar 10. It said Saudi Arabia had also mobilised 150,000 troops near the border, while all civilian flights were halted at seven Saudi airports in the border region. The government in Riyadh said it was boosting security on its borders and across the kingdom, including at the OPEC kingpin's crucial oil facilities. Egypt, Jordan and Sudan confirmed they were joining the campaign. Egypt, whose government announced it was prepared to commit ground troops, said its air force and Navy were taking part in response to "demands by the Yemeni nation for the return of stability and to preserve its Arab identity". But like Iran, Shiite-majority Iraq said it opposed the Saudi intervention, with Foreign Minister Ibrahim al-Jaafari calling for a peaceful settlement, as Lebanon's Shiite movement Hezbollah accused Riyadh of "aggression" in Yemen. EU foreign policy chief Federica Mogherini warned the strikes had "dramatically worsened the already fragile situation in the country and risk having serious regional consequences". Britain, however, came out in support, while adding that "the solution to the crisis must be a political one." US Secretary of State John Kerry held a conference call with Gulf ministers to discuss the operation and "commended the work of the coalition taking military action against the Huthis" a senior US official said. A Saudi adviser said his country's defence minister warned the son of ousted Yemeni president Ali Abdullah Saleh, "who is commanding the attack on Aden that his forces face 'obliteration' if they continue their push toward Aden." Saleh, who resigned in 2012 following a year of nationwide protests, is accused of allying with the rebels, relying on the loyalty of many army units that he built during his three-decade rule. Dozens of people have been killed as the Huthis backed by troops allied to former strongman Saleh, have clashed with pro-Hadi forces in their drive southwards. Yemen has been gripped by growing turmoil since the Shiite rebels launched a power takeover in Sanaa in February. 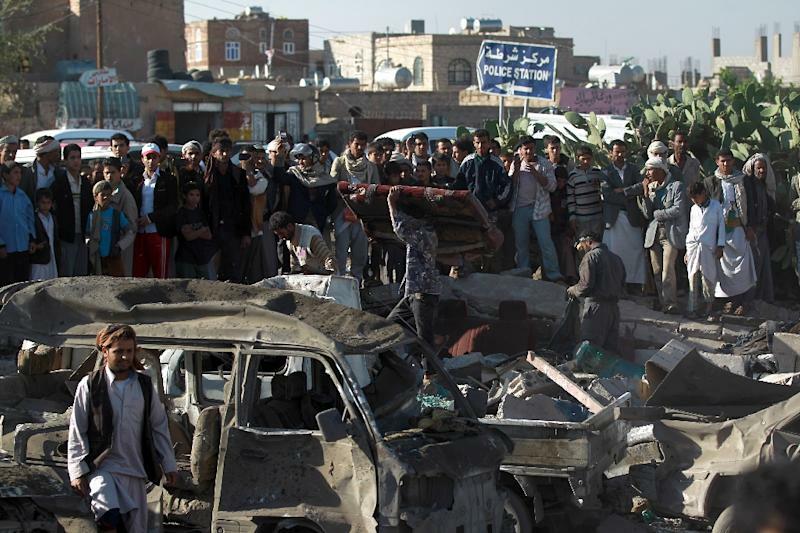 Iranian Foreign Minister Mohammad Javad Zarif said the Saudi-led intervention would lead only to greater loss of life. "Military action from outside of Yemen against its territorial integrity and its people will have no other result than more bloodshed and more deaths," he told Iranian-owned Al-Alam television channel. Prices jumped more than five percent in Asian trade, while Gulf stock markets initially fell sharply before rebounding at the close.